Spider vein treatment can be performed in our vein care center at Total Vein Care. Laser treatment for spider veins is not the first choice. 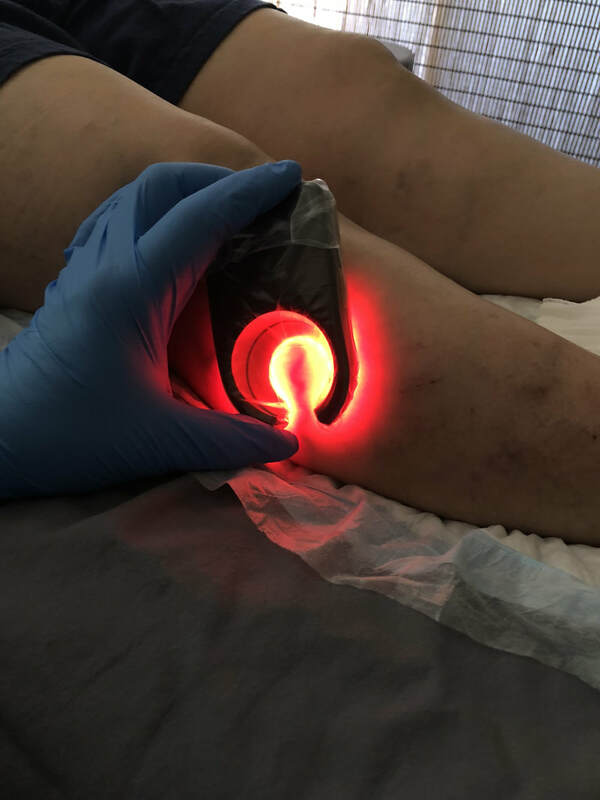 Laser spider vein removal performed in centers not adequately trained in how to treat spider veins, often fails to seal off the deeper reticular veins, which require sclerotherapy injections. If one wants to get rid of spider veins for good, it is necessary to eliminate the high pressure from the reticular veins, which feed the spider veins. This requires a specialized tool to visualize the veins deep to the skin. If the reticular veins are left untreated, spider veins usually return, often within a few months. Spider veins, or telangiectasias, are dilated veins within the skin. By definition, they are no more than 1 mm in diameter and can appear in a color range from red to dark purple. As many as 60% of people have spider veins and, for most part, they are of cosmetic interest, although some complain of pain or tenderness in the affected areas of skin. 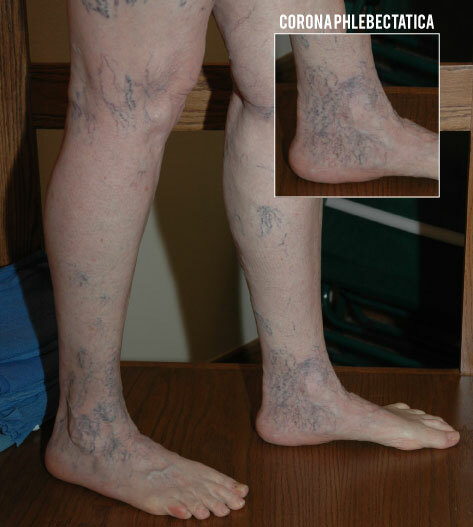 In most cases, the cause of these veins is unknown. However, some people are genetically predisposed while others develop them from chronic venous insufficiency with venous hypertension, or hormonal causes such as pregnancy, estrogen-containing birth control pills, postmenopausal hormone replacement, and topical steroid medications. Reticular veins are dilated bluish-green veins located just deep to the skin. They are usually between 1 and 3 mm in diameter. 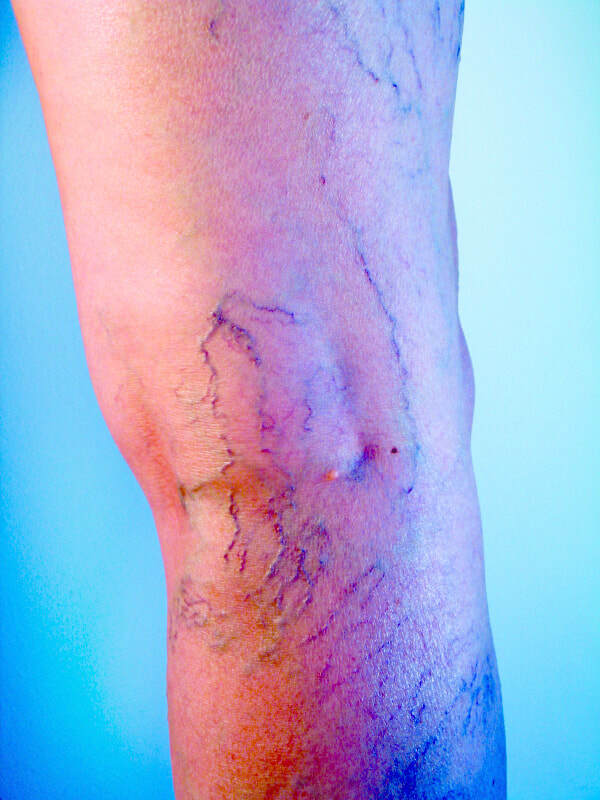 Spider veins are connected, through reticular veins, to the deeper parts of the venous system. Corona phlebectatica, or malleolar flare as it is sometimes called, is a fan-shaped group of spider veins that develops on the inside or outside of the ankle. Most feel this is an early sign of advanced vein disease. The first choice for treating spider and reticular veins is sclerotherapy. This technique involves injecting a chemical into a vein, damaging it from the inside. The sclerosants we use are prepared in solutions containing local anesthetic and delivered through tiny needles, minimizing discomfort during the procedure. The reticular veins, deep to a cluster of spider veins, are usually not visualized clearly enough through the skin to allow safe injection. With room lighting off, a Veinlight, a small, horseshoe-shaped instrument, is placed over an area of skin containing spider veins. An array of LEDs on the undersurface of the instrument illuminates the soft tissue, allowing visualization of the reticular veins as dark lines within an orange field. This technique greatly facilitates accuracy in treating the deeper veins. The lights are then turned on and the darker spider veins, located within the dermis, are injected with the aid of a polarizing headset, which, like polarized sunglasses, eliminates the glare on the surface of the skin, produced by sclerosant fluid. This technology greatly enhances the accuracy of injecting the spider veins. Following sclerotherapy, compression stockings are usually worn for a few days. Patients return after a month, to be checked for “trapped blood, “which occasionally results from blood backing up into a large reticular vein shortly after an injection. If this blood is not drained, it can leave a permanent brown spot. It is easy to remove through a few needle “pokes.” Approximately one patient in 10 returns with trapped blood. Because a treatment is never 100% effective in removing spider veins, additional sclerotherapy sessions may be required to achieve the desired result. Patients are told to expect a 50% reduction in the quantity of spider veins, which leads to lightening of an area sufficient to satisfy many patients. If a greater reduction is desired, additional treatments can be performed. Overall, sclerotherapy is the most effective treatment for spider veins. Its most common undesirable side effect is hyperpigmentation, which rarely persists beyond 1 year. However, this can be more problematic in people with dark hair and skin, such as Native Americans and Asians. Sclerotherapy of reticular veins using transillumnation. ​Laser and intense pulsed light (IPL) are effective for treating spider veins. They are a good alternative in patients with a phobia for needles. Laser is particularly effective at treating spider veins resistant to sclerotherapy, as well as “matting,” extremely fine spider veins that develop in areas previously treated with sclerotherapy. Laser is also preferred in patients who develop hyperpigmentation after sclerotherapy, or do not tolerate the sclerosant. Laser is ineffective in patients with tanned skin after sun exposure. Without also treating the deeper reticular veins, the results of laser treatment are often disappointing over the long term. Treatment of the reticular veins with laser is more difficult because, without precise control of the depth of the beam, skin burns can occur. More commonly, when utilizing a laser for treating spider veins, the reticular veins are injected with a sclerosant. A number of medical conditions may cause the appearance of spider veins, and some of these may be associated with skin hypersensitivity to light exposure. In patients with these conditions, laser or IPL may not be effective or may actually cause harm. Ohmic thermolysis, or thermocoagulation, is an effective alternative to laser. With this technology, a “microburst” of high frequency energy is delivered through a very fine electrolysis-type needle, pressing on the skin over a spider vein. Only enough pressure is applied to blanch the vein. When an electrical pulse is created, the heat energy dissipates so quickly that it coagulates the blood within the vein and damages the vein wall without injuring the skin. It is generally less painful than laser and we find it most useful to treat spider veins on the nose and face. It is not subject to the same limitations as laser with respect to skin pigmentation. Ohmic thermolysis systems have been manufactured under the trade names Veinwave® and VeinGogh®.